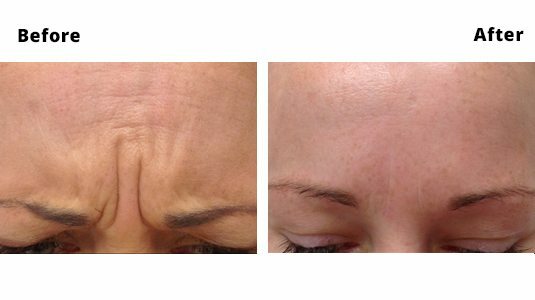 Frown lines can often make people look angry or older than they are but our anti-wrinkle injections can reduce signs of frown lines. In our Dublin Anti wrinkle clinic, we treat the Vertical wrinkles between the eyebrows in the area known as the Glabella. These frown wrinkles can give some people an ‘angry’ appearance. These glabellar 11′s are caused by several small muscles we use in this area. We usually use these muscles for frowning and communicating anger to others. These muscles are also used when squinting, so not wearing glasses or sunglasses when you need them can make these creases develop quicker than they otherwise would. Anti Wrinkle Injections can be used to reverse or slow down the progression of the frown. Most people in our Dublin clinic can be quite easily treated with Anti Wrinkle Injections and if necessary, with dermal fillers. The anti wrinkle injections into the muscles causes them to be treated fully to stop movement in this area and thereby often remove the lines and wrinkles. Alternatively, the anti wrinkle injections can treated partially, depending on the amount of toxin used. Usually treatments need to be repeated twice to three times per year. Over time repeated use of this anti aging treatment can mean you require anti-wrinkle injections less frequently or less strong treatments as a result. How much do anti-wrinkle injections cost? Anti-wrinkle injections can either be priced by area – we charge €300 for 1 area and then add on to each additional area. The other way to charge is by unit or anti-wrinkle toxin. This is difficult for the patient to know how much anti-wrinkle injection they need as everyone is different. But charging by unit of anti-wrinkle injection may work out cheaper in some cases.